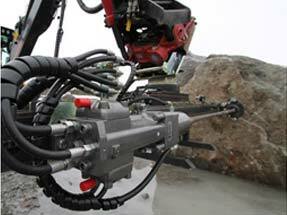 Doofor DF530S is a new generation high-power and high-frequency rock drill for general excavations, mining, and quarrying. Suitable drill steels are 28mm [1 ¹/8”] and 32mm [1 ¼”] extension- and drifter steels. The rock drill is equipped with a separate side flushing box. Flushing can be done with water or with air. 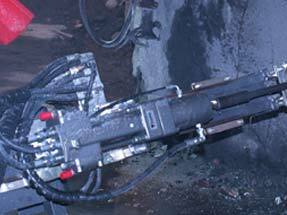 The rock drill can be equipped with an R28 or an R32 -male shank adapter (striker bar). Optimal maximum hole diameter for the DF530S is 45mm [1 ¾”]. 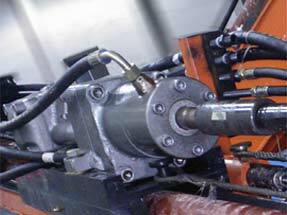 *) Numbers given are for a standard rotation motor (32cm³) at an intermittent pressure of 140bar [2031psi]. Motor options are 12.5cm³, 20 cm³, 32cm³, 40cm³ and 50cm³.